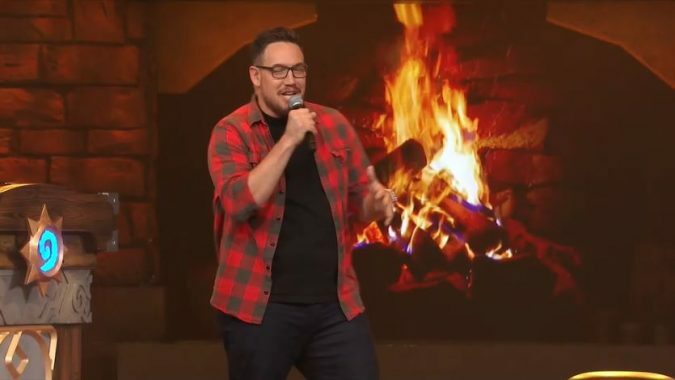 Blizzard Watch sat down with Hearthstone Game Director Ben Brode and Senior Producer Eric Del Priore for a cozy fireside chat about the game’s just announced Dungeons & Dragons-inspired expansion, Kobolds and Catacombs and other upcoming improvements to the game. How are the expansion cards separated into dungeon run cards and cards for playing against opponents? The single player experience pulls from cards from many expansions, plus the new expansion. We’ve also made a set of cards unique to dungeon runs that you would never play against another player. They’re rude. But you can play them against an AI. So there’s some really fun, powerful cards there. It’s a completely different experience that you don’t have to build a deck for. What was the idea behind creating a dedicated single-player experience in the expansion? Many of our expansions have had single player experiences. For Kobolds and Catacombs we were inspired by one of the brawls, I think Captain Blackheart’s Treasure, where you got five cards a turn and any cards you don’t play you discard and then you discover a card that gets shuffled into your deck. So you get this experience of upgrading your deck all the time. It had the feeling of leveling up your deck and getting better. We’ve been looking for ways to do that for a long time and this felt like the right way to do it. 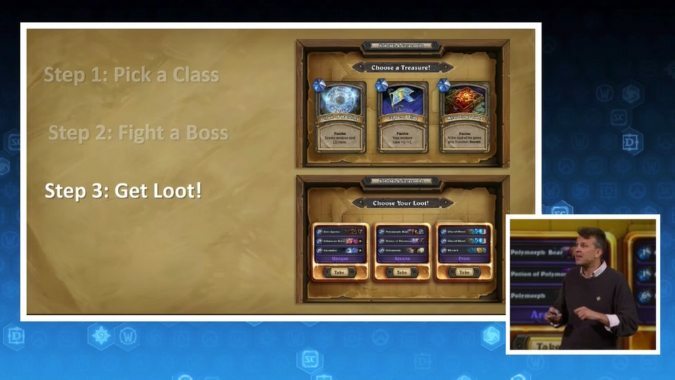 Since not all legendary weapons will be attack weapons that will go away after they run out of charges, how will players remove their opponent’s weapon from the board without having to keep Harrison Jones in their deck at all times? We didn’t want to give casters traditional weapons with attack, but we have designed them to go away in a certain amount of time. For example, the Dragon Soul legendary that we revealed at BlizzCon activates after three spells are cast and the dragon is summoned. Do you have any plans to revamp the ranked ladder? We understand there’s some frustration with players with the matchmaking system. If you are Legendary player you get reset to level 15 every month and then have to play far too many games to get to the point where you are having competitive matches again. If you’re lower ranked, you’re faced immediately at the beginning of the month with all these players who will crush you and you have to wait for them to rank up before you have a chance for more evenly-matched games. We are actively working on solutions. It’s a big focus right now internally. But we don’t have anything we can announce about it today. Is there a card in the expansion you’re super excited about? Yes. Crushing Walls (Hunter Card: Destroy your opponent’s left- and right-most minions) is super fun to me. I don’t know if they’ve shown off the animation, but it’s wholly satisfying. I’ve been playing a Hunter since Knights of the Frozen Throne so I’m looking forward to more Hunter control cards. Are you going to change more popular cards with the expansion release like you did recently with Innervate? 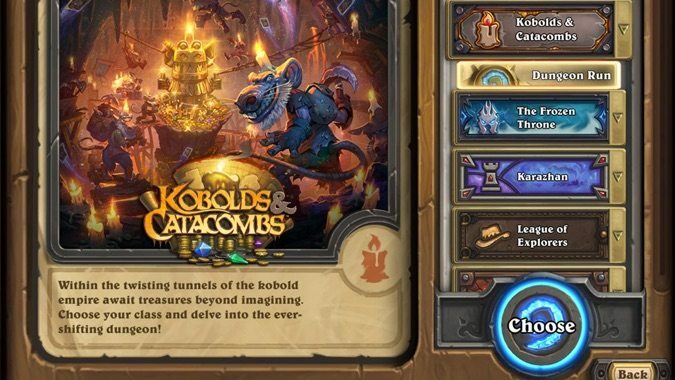 Nothing will be changed with the release of Kobolds and Catacombs. Standard play, however, is most fun when it’s changing. And there are certain cards in Basic and Classic that are so powerful and archetype-defining that you will see them year after year unless something changes. The Freeze Mage is an example. It’s fun, we like Freeze Mage. The question is: should it be in every year of Standard for all time? I’m not sure. That’s the goal of Basic and Classic sets. To be powerful. To give players the opportunity to get into the game easily. The cards that create those kinds of decks are the ones we are going to be looking at for all the rotations for next year. What plans do you have for Fireside Invitationals? We have plans to improve the experience based on recent feedback. It’s transformative to play Hearthstone in the same room as your opponent. And there are different kinds of game modes you can do in person that you can’t do online. For example, we did a 3v3 brawl because you can pass the device back and forth between your friends while the opposing team is doing the same. You can’t do that online. And I think that’s the beginning of a ton of different game modes we can only do at Firesides.